Thank you Fadel for your appreciation. I'm very happy that I was found worth for this. What a great picture. Love the composition and vivid colors. love the post pro work also, masterfully done. Strong humanity capture Saqib...very nice depth. Congrats for the "Photographer of the Day" and congrats for being on the front page. Powerful image and powerful words, Saqib. Let's hope it does not fall on deaf ears of politicians and so-called "world leaders". Good image with nice tight composition and good use of selective focus. Congrats on front-page award. absolutely fantastic my friend.. have captured an impressive face and mood of portrait!!! excellent and just a POD wel deserved it!! my best congratulations and ...see you later.. 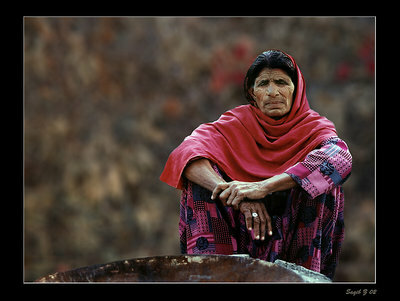 Very expressive image with beautiful colors Saqib, congratulations on the POTD award, very well deserved indeed!! Ned your observation is correct. The reason I made this shot like the way it is, was to show the subject in dreams where the world around looks dark and pale. As you can see from the original image attached above, there was depth present... but I opted to change it. the absence of a foreground and the completely blurred background make this picture like it was shot up in the space .. it needs some depth, otherwise this is a great shot of strong emotions. Wonderful colors, excellent dof (and photo work :) ) fine details, 1a composition, big congrats! Thank you Robert for your visit and nice comment. If you are in your 30s like me it was very hard to miss the Seattle scene specially with all those adolescence hormones flowing. The trio of the bands was a success in my opinion and the music was unbelievable. Thank you Latif for the kind comment. I apologize I'm just being lethargic. Will Insh'allah do it today. Whoa! Unbelievably powerful image, Saquib. Photography at its finest. The background work is very well done Saqib. You were quite right that the original was a bit distracting, but this is well seen and blended. The subject is also well seen and captured, with rich colors and contrast that really help set the mood for this scene. I must say, I am also impressed that you are so famaliar with this song by Temple of the Dog. The lyrics do fit your scene well. Nicely done in all regards. Fantastic portrait with excellent colour tones. Thankyou somuch Saqib for your comments. Thank you Saeed for your kind words. I'm glad that you thought it to be a worthy pic. Glad to see you too Humayun and I'm glad that you liked the shot. The original background was a bit distracting. Here is the file. Glad you liked the work. I would never had noticed this alone!!! WOW! Fantastic! What was the original background of the lady? great shot and nice cropping! Thanks Marco for your encouraging comment. Glad you visited this pic. Thanks for liking the shot Mahamed. The rest unfortunately sad but true. Its a long debate on why how, what and who. I have very strong opinions about these things. But we'll leave that for later. Thanks Patrizio for liking the shot. Appreciate it. The colors are pretty much natural. However I changed the background with a shot of dried up branches and leaves and added some Lens blur. I chose this background in line with the theme. The background was shot a few days back in a park near madina road where I work. 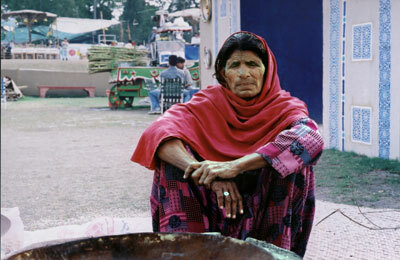 The lady was shot in 2002 in Lahore. Glad you liked the emotional part of it as this was the theme of the pic. Thanks for visiting. Thank you Rosario for your kind comment and visit. Great portraiture with pleasant background colour. But your essay coupled with the subject's face is very disturbing. And the colors are so good to be true!